CPSO Consultation on Physicians and the Human Rights Code Project Submission to the College of Physicians and Surgeons of Ontario (2014) Ethical Cleansing in Ontario	Access - or Ethical Cleansing? Following a preliminary consultation ending in August, 2014, a working group at the College of Physicians and Surgeons released a draft policy called Professional Obligations and Human Rights (POHR) in December for a second stage of consultation ending on 20 February, 2015.1 The most contentious element in POHR is a requirement that physicians who object to a procedure for reasons of conscience must help the patient find a colleague who will provide it. The consultation process is intended to provide the public and members of the profession an opportunity to comment on policies being developed by the College.2 One of the strands in the consultation process is a Discussion Forum on the College website.3 The Forum is used to solicit direct feedback from forum participants. 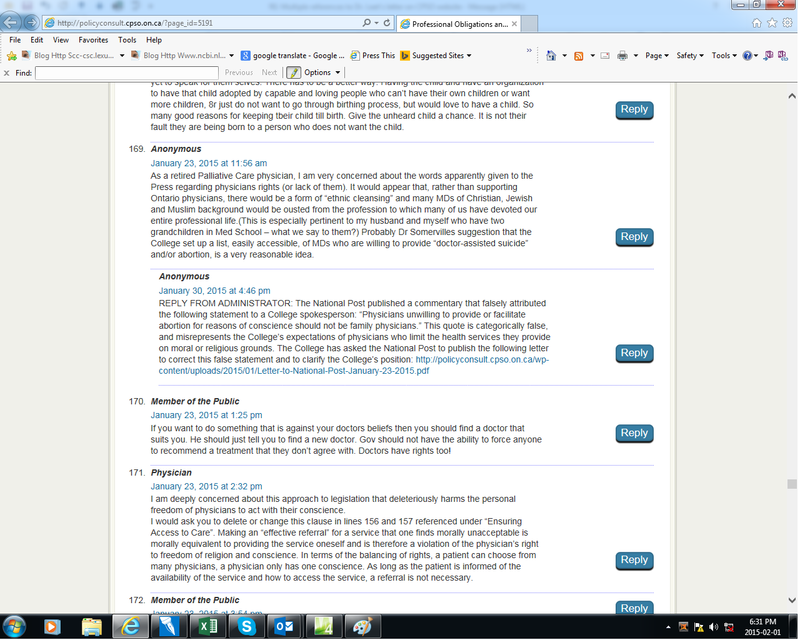 In addition, the College uses the Forum to post submissions received by email and regular mail. Remarkably, it appears that the College is manipulating the current consultation process by intervening in the Discussion Forum in order to discredit critics and defend its draft policy. The College of Physicians and Surgeons of Ontario. The College's post in the Discussion Forum ended with a link to a letter to the National Post about Professor Somerville's column from the Dr. Carol Leet, President of the College. She said that she was "dismayed" to read the quote attributed to Dr. Gabel. If Dr. Gabel "said no such thing," why did neither he nor Dr. Leet object to these stories or later reports to the same effect? More to the point, why is Dr. Gabel missing in action? If he really "said no such thing," it should be a simple matter for him to write the National Post and explain exactly what he did say - or meant to say. He does not need Dr. Leet to act as his mouthpiece. The real story here is that Professor Somerville, like The Catholic Register, simply and accurately conveyed the implications of Dr. Gabel's comments (whether or not the quote attributed to him is word-perfect) and went on to explain why the draft policy is unacceptable. A pair of misplaced quotation marks gave Dr. Leet an excuse to create a smokescreen to distract readers from Professor Somerville's able critique: hence the letter to the National Post. Whatever the merits of her complaint, Dr. Leet was clearly within her rights to respond to Professor Somerville's criticism by expressing her belated "dismay" in a letter to the editor. 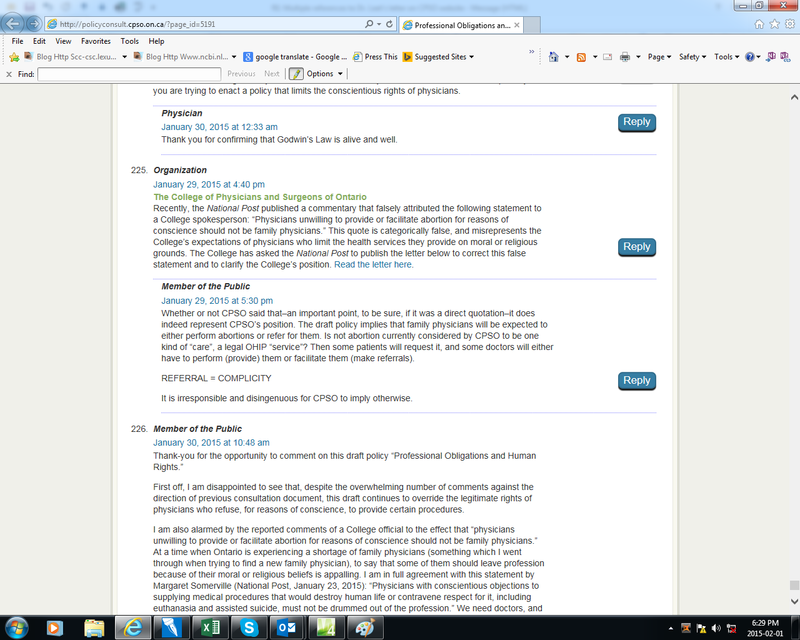 However, the College's manipulation of the consultation Discussion Forum to defend its draft policy is unacceptable. Posting its own comment was an abuse of its power and objectionable in itself, but the College went beyond this in attempting to influence the consultation process. The next day the College official discovered two entries lauding Dr. Somerville's National Post column, one made six days earlier. 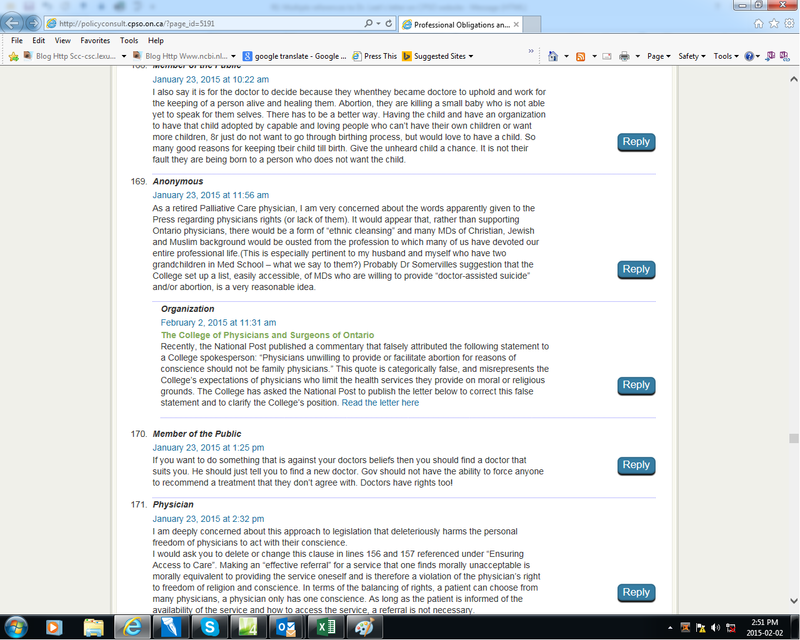 The official added an anonymous reply to both, copying the text of the College comment in order to rebut the respondent's contribution and "correct" the record, as it were,10,11 despite the College's statement that it does not do such things.12 Someone reading the replies would have assumed that they were made by forum participants who agreed with the College. How do we know that these anonymous replies were made by the College? We do not know whether this was done because someone was concerned that the impersonation of anonymous respondents might be discovered, or if it was thought that identifying the College as the author would give its "corrective" interventions more credibility. What is most ironic here is that the College is supposed to be the watchdog protecting the public and profession from unethical conduct. It seems this watchdog needs a leash. We have read your Blog article that questions the College's consultation process and insertion of comments on the Discussion Board. As with any policy consultation, the College will at times respond to feedback received on the discussion page to provide consultation participants and readers with further information and/or clarification. In this case, a quote, published in the National Post was falsely attributed to a College spokesperson. Where this National Post article is mentioned on the Discussion Board, we have pointed readers to our formal response, which was sent to the National Post. An administrative error, which initially labelled these posts as "anonymous" has been corrected. 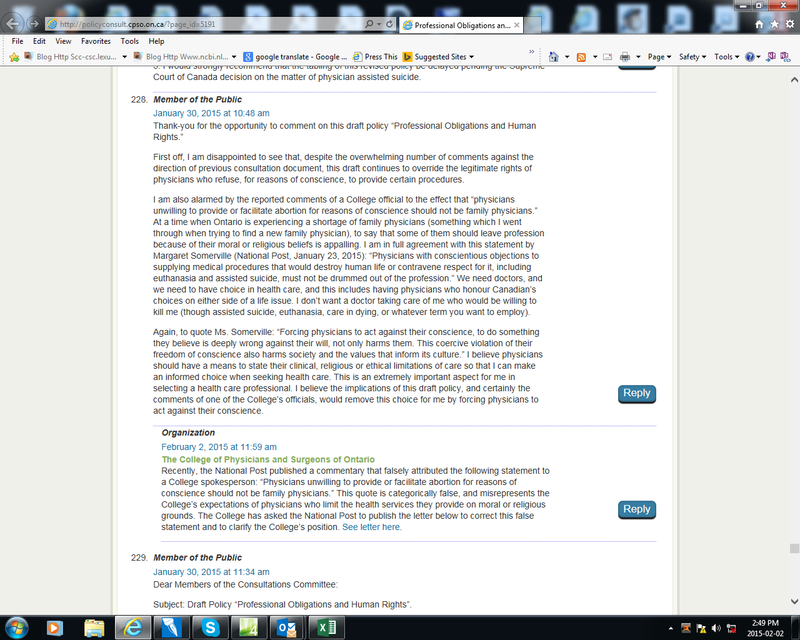 The posts have now been appropriately labeled as authored by the College of Physicians and Surgeons of Ontario. 1. College of Physicians and Surgeons of Ontario. Professional Obligations and Human Rights (Draft) [cited 2018 Dec 03]. 2. College of Physicians and Surgeons of Ontario. The Consultation Process and Posting Guidelines [cited 2018 Dec 03]. 3. College of Physicians and Surgeons of Ontario, Professional Obligations and Human Rights- Discussion. 2014 Dec 10 to 2015 Mar 03 (CPSO Discussion) [cited 2018 Dec 03]. 4. CPSO Discussion. Entry 225: Organization (The College of Physicians and Surgeons of Ontario). 2015 Jan 29 at 4:40 pm. Screen shot taken 2015 Feb 01 at 6:29 pm [cited 2018 Dec 03]. 5. Somerville M. A modest proposal for respecting physicians' freedom of conscience. National Post. 2015 Jan 23 [cited 2018 Dec 03]. 6. Leet, Carol. (Office of the President, College of Physicians and Surgeons of Ontario ). Letter to: National Post, Op-Ed Editor. 2015 Jan 23 [cited 2018 Dec 03]. 7. Murphy S. Ethical Cleansing in Ontario. 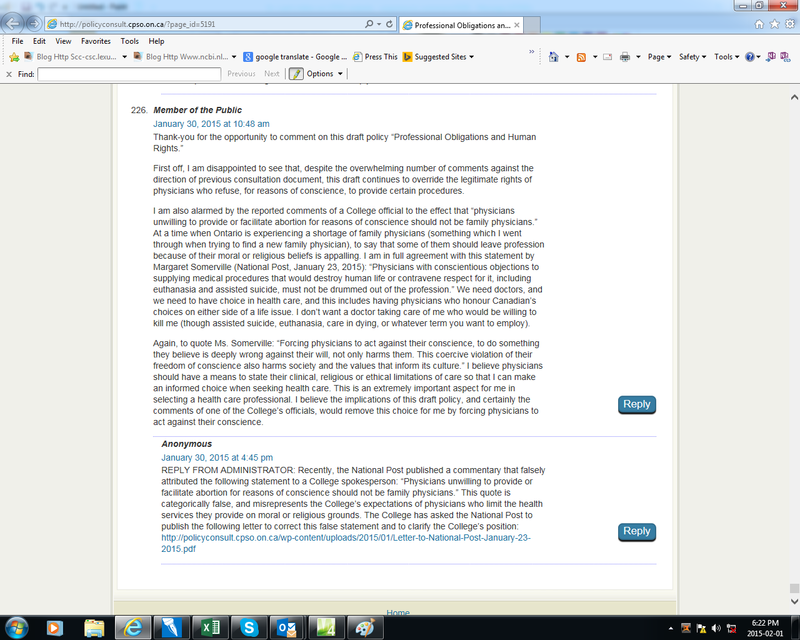 Protection of Conscience Project News and Blog. 2015 Jan 12 [cited 2018 Dec 03]. 8. 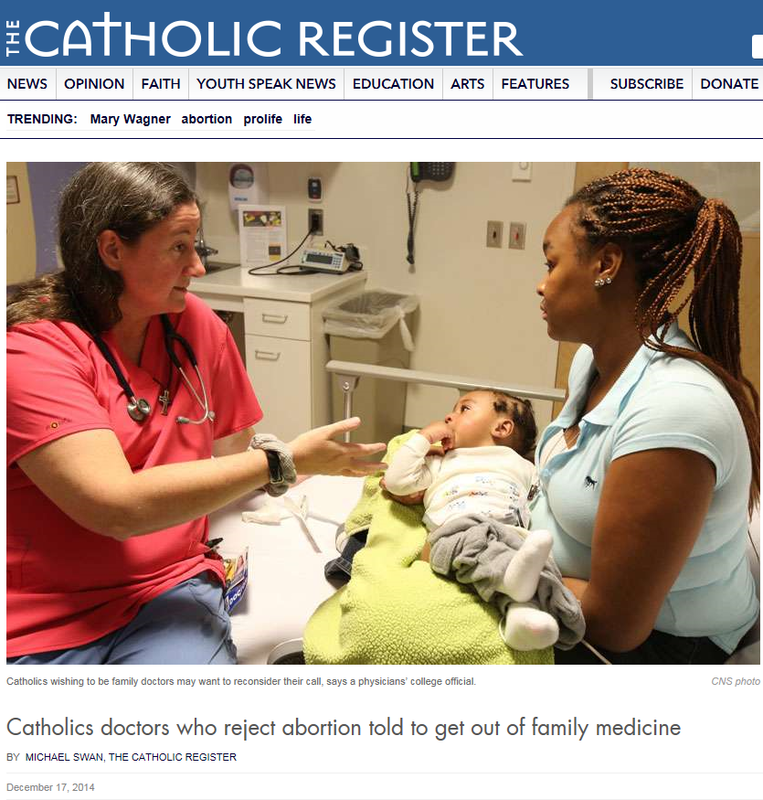 Swan M. Catholic doctors who reject abortion told to get out of family medicine. The Catholic Register. 2014 Dec 17 [cited 2018 Dec 03]. 9. Weatherbe S. Doctors who oppose abortion should leave family medicine: Ontario College of Physicians. LifeSite News. 2014 Dec 19 [cited 2018 Dec 03]. 10. CPSO Discussion. Entry 169: Anonymous. 2015 Jan 23 at 1156 am. Reply: Anonymous (College). 2015 Jan 30 at 4:46 pm. Screen shot, taken 2015-02-01 at 6:31 pm [cited 2018 Dec 03]. 11. CPSO Discussion. Entry 226: Member of the Public. 2015 Jan 30 at 10:48 am. Reply: Anonymous (College). 2015 Jan 30 at 4:45 pm. Screen shot taken 2015-02-01 at 6:22 pm [cited 2018 Dec 03]. 12. "The College does not review any content of any feedback for accuracy. The College does not review any references or links in any feedback either for accuracy or with respect to the content of the document referred to or the site linked. . ." College of Physicians and Surgeons of Ontario. The Consultation Process and Posting Guidelines [cited 2018 Dec 03]. 13. CPSO Discussion. Entry 228 (previously 226; see note 11). Screen shot taken 2015-02-02 at 2:49 pm. 14. CPSO Discussion. Entry 169 (See note 10). Screen shot taken 2015 Feb 02 at 2:51 pm [cited 2018 Dec 03].